October 13, 2018 – Charlotte Hornets President of Basketball Operations & General Manager Mitch Kupchak announced today that the team has exercised the two-way player conversion option on guard Joe Chealey. Per team policy, terms of the deal were not disclosed. Additionally, the team announced it has waived forward Zach Smith. Chealey, a College of Charleston product, was originally signed by the Hornets on July 27 as an undrafted free agent. He has appeared in three preseason contests with Charlotte and has averaged 4.3 points and 1.0 assists per game. The 6-3 guard participated in the 2018 MGM Resorts NBA Summer League with the Hornets. In four games, he averaged 6.3 points, 4.3 rebounds and 2.8 assists in 17.4 minutes per game. The Orlando, Fla. native played in 129 collegiate games over four years (2014-18) for the Cougars, finishing his career with averages of 14.2 points, 3.5 rebounds and 3.1 assists in 31.1 minutes per game. Chealey left Charleston as the school’s all-time leader in free throws (582), ranked fourth in scoring (1,825) and eighth in assists (395). As a senior in 2017-18, he averaged 18.0 points, 4.6 rebounds and 3.6 assists in 34 games played, earning both All-CAA First Team and All-Tournament Team honors for a second consecutive season. Chealey joins JP Macura as the two-way players under contract with the Charlotte Hornets for the 2018-19 season. The 2018-19 season is the second year NBA teams can utilize two-way contracts, in which teams will be permitted to carry two such players on their roster in addition to their 15-man regular season roster. Charlotte’s two-way players will spend time with the team’s NBA G League squad, the Greensboro Swarm, as well as the main club, but are allowed no more than 45 days in the NBA, not including any time prior to the start of the Swarm’s training camp and at the end of the Swarm season. 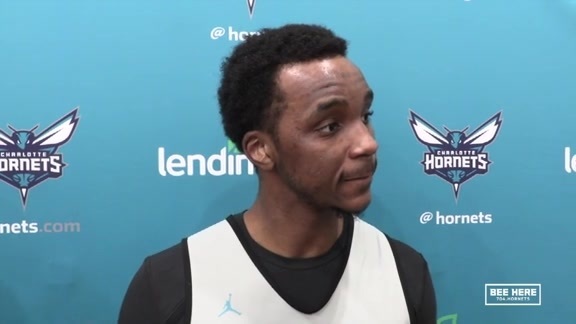 Smith, originally signed by the Hornets on July 26 as an undrafted free agent, appeared in one preseason game for Charlotte. The 6-8 forward spent four seasons at Texas Tech University where he helped the Red Raiders to two NCAA Tournament appearances. Smith played in 117 career games for the Red Raiders and was named All-Big 12 Honorable Mention in 2016 and 2017.